Activated carbon has been used for many years in both saltwater and freshwater aquariums for a number of purposes. Activated Carbon is also called activated charcoal, activated coal or carbo activatus. Activated carbon is a form of carbon that has been processed to make it extremely porous and thus to have a very large surface area available for adsorption or chemical reactions. Activated carbon is manufactured from carbon, typically coal. The two most common forms are bituminous and lignite based. Another form that is not made from coal is coconut shell based. Activated carbon is processed into 3 forms: Granular, pellets and powder. The granular and pellets are most commonly used in aquarium filters. The use of activated carbon in marine tanks is considered to be a form of chemical filtration. Working through absorption, activated carbon removes gelbstoff (the compounds that give water in an aquarium the yellow tint), some large organic molecules, medications, chlorine, pollutants and toxins, as well as many other types of chemical elements and compounds from the water that a protein skimmer or another means of filtration may not remove. Activated carbon can also remove the trace elements and minerals that are important to your fish, invertebrates, and corals. A recent study has found that the heavy use of activated carbon in marine aquariums can cause Head & Lateral Line Erosion disease (most often seen on fish in the Surgeonfish Family). This can be avoided by using a trace element additive in the aquarium. Because of its large surface area per volume, activated carbon also makes a good biological filtration platform. Pelletized carbon is used in the DIY Carbon Tube Filter with excellent results. When activated carbon is placed in a Canister Filter, is also serves as a biological Filter. In order for the carbon to be effective, water must flow over/through the carbon material. Activated carbon is used in a number of aquarium filtration systems. As stated earlier, activated carbon can be placed in one or more of the chambers of canister filters or in a Carbon Tube. Replaceable filter pads in most power filters incorporate granulated carbon in the pads. Carbon can be spread in a Wet/Dry Trickle Filter tray (pelletized carbon works better here). Mesh bags can also be filled with carbon and placed in the aquarium water flow area in a sump. How Often Should Carbon Be Used? 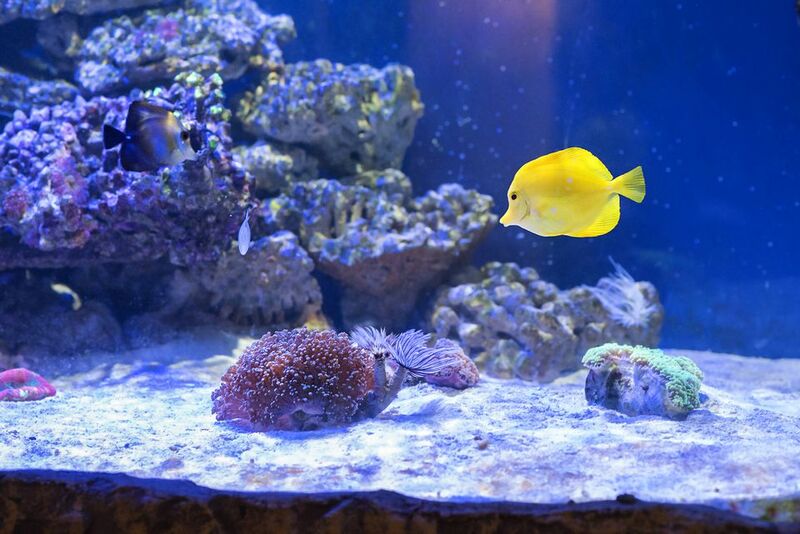 The two main concerns about using carbon in a saltwater system are that carbon often leaches phosphate into the aquarium and that it removes necessary trace elements needed by reef animals, particularly corals. The Phosphate Leaching IssueAs far as phosphate goes, you want to remove this element from your tank, not add it. A high phosphate accumulation in saltwater aquariums can lead to aggressive hair algae blooms that are difficult to get rid of, and since some brands of carbon may leach phosphate into an aquarium, you should test the carbon you are using or going to use for leaching. If you find any relevant traces, you can change to a different brand, or remove the phosphates from your system either by using a Phosphate Removing Product or via the Vodka Method. The Trace Element AbsorptionThere has been an ongoing controversy amongst aquarist for years if you should use carbon continuously, just when needed, or even at all. The trend leans towards using carbon only when there is really a reason its use is warranted, because a healthy system, particularly one that has an adequate protein skimmer installed should not require it. Richard Harker's iodide absorption test results lead him to conclude that, "the use of carbon has minimal impact on iodide concentrations and that passive use of carbon has no lesser effect on iodide levels than active use." Our conclusion here is that if you decide to use Activated Carbon on a continuous basis and are concerned about the possible loss of trace elements, add some trace element supplements in conjunction with the activated carbon, as well as bypass the water flow through the carbon for a short period of time before and after supplements have been added to allow it to be absorbed by the reef life and not the carbon. How Much Carbon Should Be Used? More is not always best, and using the least amount of carbon necessary is recommended. The general consensus here is that a quantity of about 3 level tablespoons of carbon per 50 gallons of actual tank water volume should be sufficient to keep a saltwater aquarium or reef tank system color free. How Often Should Carbon Be Changed? Like most other absorbing compounds, carbon can only absorb as much as it can hold. Once it has taken in as much as it can, it becomes exhausted, which means it is unable to absorb anything more. For this reason, it needs to be changed and replaced or rejuvenated for reuse. Not all aquariums run the same, so as far as determining when to change the carbon, this is something you will have to figure out on your own. By sight, you definitely know it's time when the aquarium water begins to get a yellow tinge to it, but there are ways to test it as well. The bottom line is that it's best to use smaller amounts changed more often. Take into consideration; not changing all the carbon too quickly if your water is significantly yellow, as this can expose corals to too much UV light abruptly which can lead to coral bleaching and possible death. Does your saltwater aquarium need a sump?